(Cajanus cajanus)The cultivation of the pigeon pea (toor dal) goes back at least 3000 years. Originating in Asia, it traveled to East Africa and by means of the slave trade to the American continent. 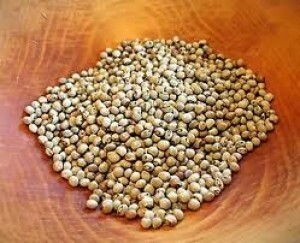 Today, pigeon peas are widely cultivated in all tropical and semitropical regions of both the Old and the New Worlds. In India, split pigeon peas (toor dal) are one of the most popular pulses, being an important source of protein in a mostly vegetarian diet. In regions where it grows, fresh young pods are eaten as a vegetable. The split dried seeds are used as a lentil, in dishes such as sambar.